Mercedes has not just sculpted a coupe version of C-Class saloon but has also bestowed on it AMG body kit and various changes in tandem with efficient AMG family. The two-door coupe version of C-slaoon, AMG C 63 S is mostly the same as its saloon sibling, however it does get a couple of tweaks that set it apart from the former. Mechanically, it is more powerful and promises zippy performance. Inside the cabin, carbon-fibre has been used abundantly. Moreover, the coupe is available on the more powerful S version. 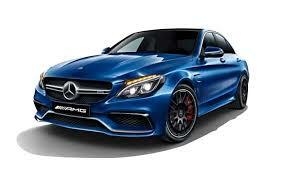 Its external appearance is quite sportier like any other AMG model. To begin with the front facade, it comes with distinctly styled radiator grille with a single chrome louvre. It is flanked by a sleekly structured headlight cluster, which is powered by high intensity xenon headlamps along with trademark LED daytime running lights. This saloon also gets a Unique AMG bonnet with powerdomes, which gives a masculine look to the front facade . The front bumper is in body color and is elegantly sculptured with a cross strut, which is in glossy black color. The overall look of the frontage is complimented by the stylish company’s logo affixed to the grille. Its side profile has expressive wheel arches, which are neatly fitted with a set of 18-inch alloy wheels. Its waistline molding gets a chrome treatment, while its door handles and ORVM caps are done up in body color. Furthermore, the side profile also has air vents and skirts, which gives it a stylish appeal. This saloon has a lustrous boot-lid, which is elegantly decorated with a chrome appliqué along with a company monogram. The taillight cluster is powered by high intensity brake lights and turn indicator based on LED technology. The main highlight of the rear is its diffuser-style apron, which is affixed with a pair of exhaust pipes and protective cladding. For all the talents the C63 AMG possesses, the interior design and ambience is one of its highlights. As the C63’s cabin is based on the standard C, you get the same dashboard which is tastefully designed and beautifully executed. The layered dash looks really attractive and the round air-vents are beautifully finished. You sit at a good height and the nicely crafted front seats are snug and well bolstered, and keep you in place even when you drive hard. Obviously, there are some additions to let you know you are not sitting in the standard C-Class. The steering wheel is a flat-bottomed that feels excellent in the hands and the centre console is finished in carbon fibre. Thankfully there is no sign of the Indian friendly beige in here and the overall ambience is dark and sporty. You also get loads of AMG badges on the seats, dashboard, door sills and steering wheel. What adds a bit of colour are the contrasting red seatbelts which look a bit quirky but special nevertheless. The Mercedes-AMG C43 comes powered by a twin turbo 3.0-litre V6 petrol mill. It is rated at 362bhp of power and a huge 520Nm of torque sending power to all wheels through the 4MATIC all-wheel-drive (AWD) system. This engine isn’t as flamboyant as the C63 AMG’s V8 powerplant, but has a charm of its own. It will not rumble at lower revs like the other performance cars. However, this is a good thing as it is silent at low rpms making sedate driving a pleasurable experience. This is where the Eco or Comfort driving mode will be mostly used. The nine-speed automatic gearbox is nicely tuned to shift gears quickly. But it still isn’t as quick and responsive as the dual-clutch transmission. That said, this trait comes to the fore only when driving flat-out. Otherwise, the healthy amount of torque is available from 2,000rpm making sure there is always enough grunt to keep going. You don’t need to slam the pedal and downshift for a quick overtake or sprint. A gentle tap on the pedal is good enough to get going. As we had mentioned in our earlier spin at the Buddha circuit, the Sport and Sport + driving modes bring out a different character to the car. The vehicle likes it when it’s given some stick. At higher revs the engine starts snarling with a nice tone, while the nine-speed gearbox is eager to hold the revs till 6,300rpm before shifting. The rev happy engine’s performance in these modes outshines the Eco and Comfort mode. In the 0-100sprint, the passengers are hurled back into their seats as the car lunges forward to the 100kmph mark in a remarkable 4.79 seconds time. The electronically limited top speed of 250kmph is easily achievable. The C43’s 4MATIC AWD system has been given a rear-bias setup to send 69 percent of the power to the rear wheels. So it isn’t boring as four-wheel drive cars are perceived to be as against rear-wheel-drive ones. In fact, this one will let you have all the fun and the electronics will play their role to keep you planted at any point. The 18-inch alloys shod with Continental ContiSportContact rubber provide phenomenal levels of grip only to help you push the car even harder. Then the AMG sports braking system has got your back as it brings the car to a stop quickly even from high speeds. This system features internally ventilated compound discs with 4-piston callipers that provide a good bite and feel. Enabling good turn-ins, the steering feel is very likable and response is sharp in the sport modes though it feels a little vague in the comfort mode. Still, the C 63 S is rapid and brims with feel and confidence from behind the wheel. The steering is a fantastic link to the changing tarmac under the front wheels. Reports of the coarseness of the tarmac and the slightest dip are murmured softly to the driver. The steering weighs up at higher speeds, demanding a playful hint of muscle to change direction. In corners, you can feel the huge levels of grip on offer from the 19-inch Michelin Pilot Sport Cup tyres. They handle the formidable task admirably, soaking up the massive forces at the rear axle during accelerating. Whilst at the front they have to deal with the, frankly dizzying, braking power offered by the carbon-ceramic brakes. In a straight line the C 63 S’ blinding speed was backed up by a glued-to-the-ground feel. Lane changes were quick and stable too. However, using the speed turned into a stop-go affair as even the slightest rough patch sent the C 63 S bucking around as the sportier drive modes gave it a race-car like tautness. There’s better compliance in Comfort mode with the AMG rounding off big bumps well. Nonetheless the road surface is transmitted into the cabin in a manner that forces the driver to scan the road ahead for poor sections of tarmac. As is befitting the AMG badge, Mercedes have gone to town when kitting up the AMG C63 S on the features & safety kit. With the latter, the German manufacturer has thrown the entire kitchen sink in. So the AMG C63 S comes with a full complement of seven air-bags in total. There’s also the top-shelf ABS, EBD and all other electronic nannies that one can think of. In terms of comfort & cabin features, there’s the usual fully articulated steering wheel, all audio controls at the finger-tips plus a snazzy heads-up display. Plus there’s also the party-trick that is the 360-degree parking assist camera vision. You also get a 13-speaker Burmester audio system, for those times, when you got to listen to a soundtrack other than the one that’s coming from the pipes. Braking remains sharp as ever, thanks to the massive discs all-round that peek from behind the multi-spoke, black alloys which offer a wonderful contrast to things as well. Our car came with the optional Carbon-Ceramic brake package which reeled in the car from the ridiculous speeds it is capable of, as quickly as it would take off. The Mercedes C63 AMG S is undoubtedly a brilliant package since it offers space for 4 passengers, comes with a loaded equipment list, has great dynamics and is a complete beast to drive with supercar levels of performance. The fact that it is a sleeper car means that it won’t attract too much unnecessary attention too. For someone who wants a fast car that is also practical and can be used daily, the Mercedes C63 AMG S makes just the perfect sense.